Cherokee Electric Cooperative was organized in 1937 and has existed to serve our members ever since. Our service area has more than 2,468 miles of lines that bring safe and dependable electric power to more than 23,000 meters. We provide services in Calhoun, Cherokee, DeKalb, Etowah, and Marshall counties. Click the tabs below to view our key staff members as well as our board of directors and the districts they represent. If you are a Cherokee Electric Cooperative member and you experience a power outage, please notify us by telephone so we can make every effort to restore your service as soon as possible. Landline telephones are not normally affected by power outages. Keep in mind that depending on the size of the affected area there could be dozens or even hundreds of members trying to call. Please be patient with busy signals and keep trying. Our service department needs to know the full extent of the outage. You may call Cherokee Electric Cooperative’s service department at 800-952-2667 or 256-927-5524. Please be prepared to provide the account number, name and phone number associated with your account. Your meter number would also help us identify your location. Yes, We accept Visa, MasterCard, or Discover (debit or credit). Can I set my account to be paid automatically each month? Yes, we offer a bank draft option. You simply need to sign our Bank Draft Authorization form authorizing the draft each month and bring in or mail a voided check. Your payment will be drafted 2 to 3 days prior to the due date. There is no charge for this service. What Is My Deposit Amount and How Long Until I Get Power? The residential deposit amount (either $150 or $300) is based on your credit. Once you complete your membership application, we will run a credit report to determine the deposit amount. Once the membership fee ($5), deposit, and service connection fee ($35) are paid, your power will be connected in 1 to 3 business days. We are open Monday – Friday from 7:30 am – 4:15 pm in Centre (lobby and drive-thru) and Tuesdays and Fridays from 8:00 am – 4:00 pm at Aroney. Note: The Aroney office is closed 12 pm to 1 pm for lunch. Membership Fee – $5.00 This fee is required prior to the time service is supplied to the consumer, and is not transferable. Upon termination of service, the membership fee may be applied against any unpaid bills of the consumer. Any remaining balance will be returned to the consumer. Consumer (Security) Deposit This fee is required prior to the time service is supplied to the consumer, and is not transferable. Upon termination of service, the security deposit may be applied against any unpaid bills of the consumer. Any remaining balance will be returned to the consumer. Late Payment Penalty: 5% of bill for the first $5,000, then 1% thereafter. Underground Service: Call our office for information. To change existing overhead service: Total cost of construction. Before you dig on or near your property, call Cherokee Electric Cooperative to locate any underground lines. Whether you are digging for a flower bed, a fence post or a swimming pool, find out if there are electric lines (or any other utilities, for that matter) buried in the area. Digging into an underground power line could not only disrupt electrical service for you and nearby homes, but it could also deliver a lethal shock! For more information, click below to visit the Alabama 811 website. Do You Offer Outdoor Lighting? Cherokee Elective Cooperative offers the safety and convenience of Outdoor Lighting to its members. A monthly fee is required. This service provides all-night outdoor lighting service using standard overhead equipment mounted on wood poles. Lamps will burn approximately one-half hour after sunset until approximately one-half hour before sunrise. 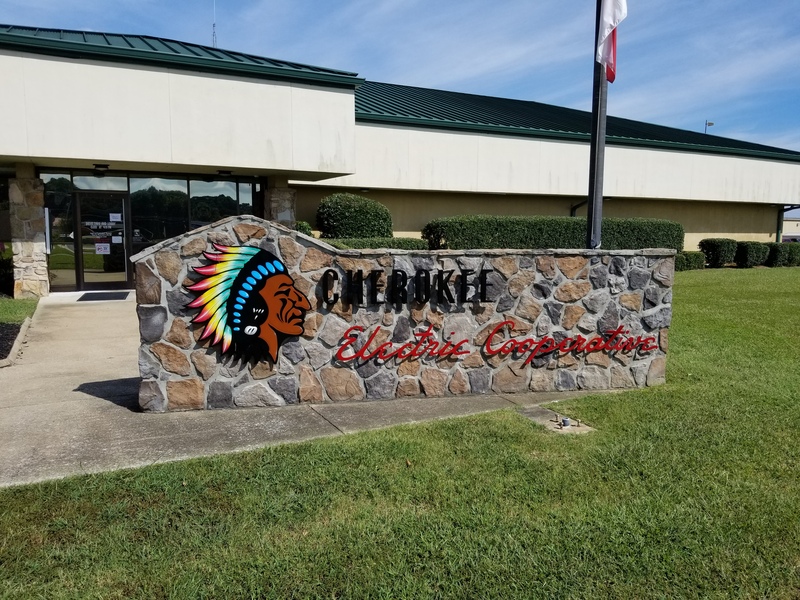 Cherokee Electric Cooperative will replace burned out lamps and otherwise maintain the yard light during regular working hours when notified by the member. Other kinds of lighting options may be available, along with various size options. An engineer will be glad to assist you in the appropriate lighting option for your residence or business. For more information, or to apply for outdoor lighting, please call our Customer Service Center. Is Doxo an authorized payment method? Doxo.com is an online bill pay service that may appear to be affiliated with Cherokee Electric but they are not. Doxo.com is a 3rd-party website that allows people to pay their bills online. As part of their service, the mail a check to the payee on your behalf. As a separate bill pay service, Cherokee Electric has no control over fees charged for their services and Cherokee Electric cannot control when we receive the member payment from doxo.com, possibly resulting in a late payment from the member or even disconnection due to non-payment. To make sure you’re paying Cherokee Electric directly, please visit our website at www.Cherokee.coop and we encourage you to use our online bill pay option. With our online Bill Pay at www.Cherokee.coop your payment is directly applied to your account and the service is free! Cherokee Electric offers our members the ability to pay their bill online by clicking the Bill Pay button on the top right of this website or click the Bill Pay button below. With Online Bill Pay you will be able to view and pay your bill. Note: If you are making a payment after the due date on your bill, additional fees may apply. Call Cherokee Electric today to update your information, get your online bill pay account set up, or sign up for E-Bill. If you are making a payment after the disconnect date on your bill, please contact our office. If you know how to read your electric meter, you can learn how much you’re spending on electricity. The electricity you use is measured in kilowatt-hours. For example, a 100-watt light bulb burning for 10 hours uses one kilowatt-hour (kWh). Your electric meter records how many kilowatt-hours you home uses. Once you know that number, you can subtract the meter reading on your last month’s electric bill from the number you obtain off the meter to figure out how much electricity – in kilowatt-hours – you’ve used since that bill. Cherokee Electric Cooperative uses dial meters on its system. Reading a dial meter involves looking at five dials. The dials, similar to a watch face, are numbered 0 through 9 with the 0 at the top. Reading a dial meter involves looking at the five dials similar to the image below. The hands on the face of the dials move in the same direction as the numbers, low to high. To read the meter, you simply write down the number that each hand has just passed, beginning with the dial on the left and going left to right. If a hand is sitting on a number, look at the dial to the right. If that hand has passed zero, write down the number that the left hand is pointing to. If the hand on the right has not passed zero, write down the last number that the left hand passed. Once you have the number from your meter, you can determine how much electricity you have used by subtracting the reading shown on your last power bill from the number you just read from the meter. Click to view a .pdf of our Bank Draft Program Authorization Document. Click below to view our Residential Membership Application. If you do not come into the office to complete this application, you must have your signature notarized and with a copy of a photo I.D. Click below to view a .pdf document of our Levelized Billing Application. Would you like to go paperless? Click below to view a .pdf document of our E-Bill Request Form. If you are 65 years or older and/or on disability/SSI you may request to have your electric bill due date coincide with the date you receive your benefits. Click below to view a .pdf authorization document. Click below to view our Water Heater Program document. Click below to view a .pdf document of our Underground Service Requirements.